Welcome to Planetastic: the Solar System Sandbox. Build a solar system stable enough to support life by placing a target number planets in orbit. The game features multi-body gravitational mechanics so the placement of all planets affect the orbits of all the existing bodies, including the Sun. The game is built in AGK v1.08 r21 in Tier 1. Revision 3 of Planetastic is now live on Google Play. The main addition to revision 3 is the introduction of the Challenge Mode. There is no time limit to complete the objectives and no 'game over' so to speak, although some challenges can become impossible to achieve if your design gets out of control. This screen gives an overview of your system before you can either stop playing or try a new challenge. 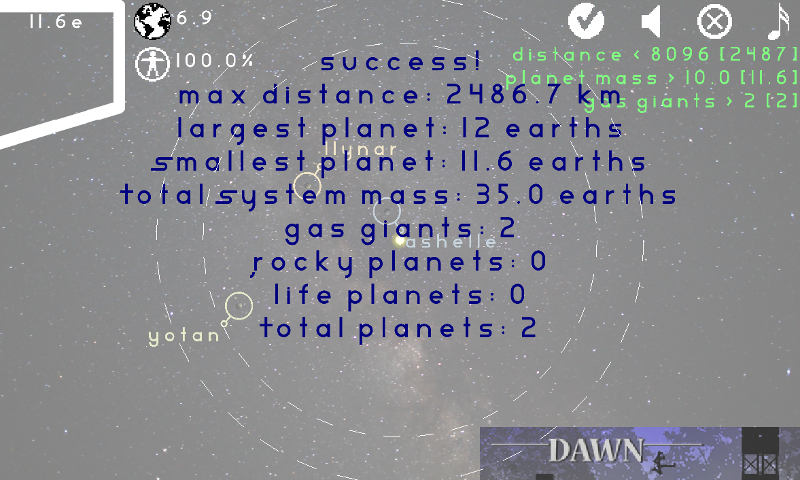 A slider on the left of the screen has been added so that you fix the mass of the next planet, rather than the planet be given a random mass. If you select a planet mass bigger than 10 earths, this planet will be classed as a Gas Giant and will now look like a Gas Giant. The auto zooming has been refined to be less buggy and more smooth. It will also track fast moving planets better so that it is easier to zoom out. A wider variety of planet imagery has been added so that all planets look more unique. The whole UI has been rearranged to provide a better experience and the planetary stats that appear when zooming no show directly underneath the planetary name. No real reason for this, other than aesthetics. Next on this horizon is a tutorial mode, the ability to name planets and random events (such as comets and rouge planets).